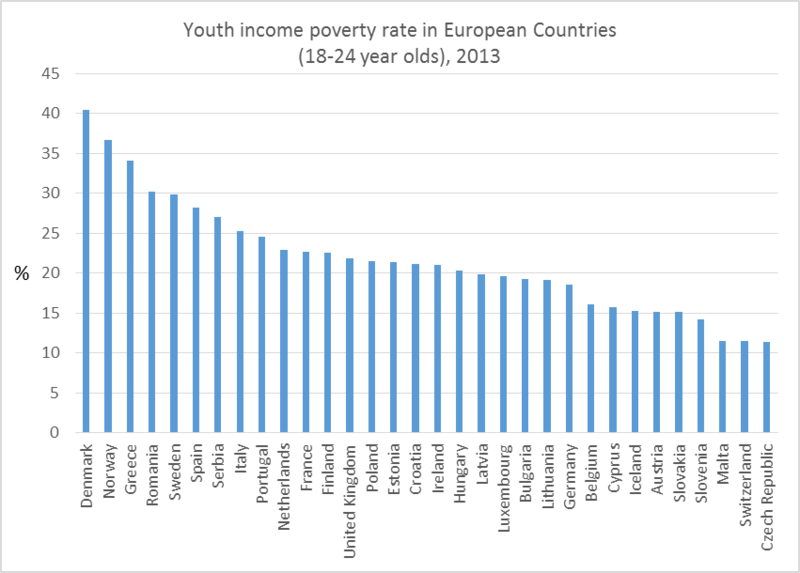 Youth poverty is generally ignored in political debates in both Europe and the UK. When youth inclusion is discussed, it tends to be in the context of labour market inclusion. Yet, labour market participation does not necessarily guarantee social inclusion. In a context of high youth unemployment and poor quality jobs, new policy proposals are needed to tackle rising youth poverty. The idea for these blogs occurred after we attended the academic Journal of Youth Studies international conference in Copenhagen (March 2015). During the conference we were struck by the large number of research presentations from all over the world where poverty seemed to be the dominant theme, although this was not articulated (or perhaps even intended) in some instances. Despite many discussions about structural contexts (i.e. poverty) only the opening keynote speech was explicit about the significance of poverty in research about young people. In a context of rising youth poverty, the academic community needs to do more to engage more directly with the concept of poverty, particularly in relation to youth, and to fulfil its own responsibilities by undertaking more research about youth poverty in the UK (and Europe). In this series of blog-posts we discuss the circumstances and conditions for young people in poverty across Europe, highlighting England and Scotland in particular where we are involved in research in this area. We argue that youth poverty should be central to any future debates about the development of social and economic policy in Europe and the UK and especially in the run up to the General Election 2015. Unless a greater effort can be made by all of us, we feel that the war on poverty cannot be won. What we say and do (or don’t say and don’t do) to address the issue of poverty which surrounds Europe says everything about us as a nation, as citizens of that nation and of course, as human beings. We view this series of blog-posts as an important first step in highlighting the significance of youth poverty across Europe and for generating discussion and debate about an increasingly important topic. We would welcome the opportunity to collaborate with colleagues across all disciplines on future posts and related articles. Youth poverty is absent from the EU political agenda. What is more, it seems that the European Union seems determined to avoid the issue altogether. For example, the latest Eurostat publication on the situation of young people in Europe Being Young in Europe today (link) describes demographic trends, health, education and labour market participation, as well as access to the digital world for both children and young adults. Yet, in the chapter that examines living conditions only the situation of children is examined. The absence of youth poverty from the political agenda may not come as much of a revelation to UK readers, as youth poverty is similarly absent from the political debate in the UK. The analysis of the political party manifestos produced by “academics against poverty” (link) concluded that: “All parties do poorly in addressing equality or the position of young people”. Is it that young people are not poor? No. Across Europe as a whole young people today are more likely to be poor than older adults, including pensioners. 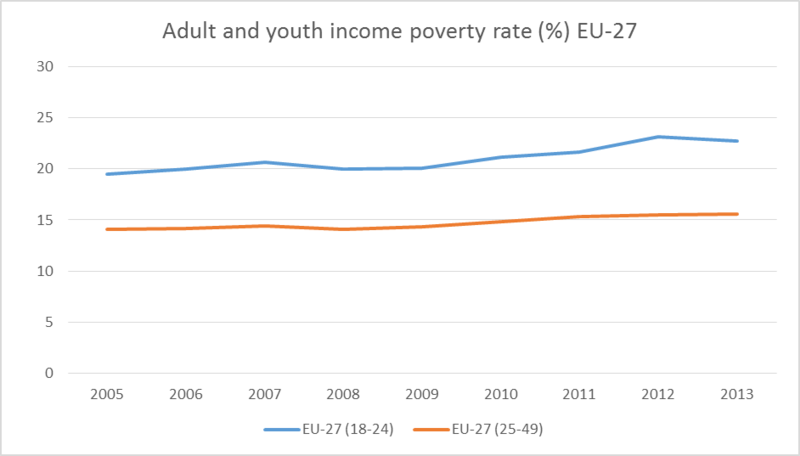 In 2013, the last year for which Eurostat provides comparable data, 23% of European youth (that is, almost one in four) had an income below the poverty line. The corresponding figure for older working age adults is around 16% (i.e. a 30% gap). Furthermore, the issue of youth poverty in Europe is not limited to the poorest countries in Southern and Eastern Europe. In fact, the highest income poverty rates are observed in countries with low overall poverty rates: Denmark and Norway. With around 22% of its youth living in income poverty the UK fares close to the European average (23%). The relative position of young people has worsened during the recession. As can be seen in the graph below, between 2008 and 2012 youth poverty increased, from 20% to a peak of 23% in 2012. During the same period poverty rates for the 25-49 age group have remained stable at around 15%, resulting in a widening gap between generations. The finding is hardly surprising given the impact of the recession on youth labour markets. Young people were amongst the hardest hit by the 2008 economic downturn, which saw youth unemployment rates skyrocket across the continent and surpass 50% in Spain and Greece. Across the OECD young people under 25 are more than twice as likely to be unemployed than older adults. In the UK the proportion is fourfold. In this context, the European Union has launched a number of initiatives to promote youth social inclusion with a strong commitment to the reduction of youth unemployment. Given the data discussed above, the European Union concern with youth unemployment is very welcome. It is also insufficient. European interventions in the field of youth tend to equate integration and inclusion with labour market participation. Activation has been consecrated by the Commission as a key principle for youth interventions, by recommending that ‘benefits are only awarded if the young person is engaged in active job search or in further education and training’ (European Commission, 2010, p. 17). The activation drift is not exclusive to the youth domain, and it can be associated with a wider trend in the OECD countries, towards increased individual responsibility for social failures. There is no consideration of the conditions in which this labour market integration occur or their potential for poverty reduction. While getting a job is a way out of poverty (see this recent report by the ONS) the ability of labour market integration to reduce poverty depends on the quality and stability of the jobs provided. And yet, policy initiatives often focus on increasing young people’s motivation and skills while job creation is largely absent from the discussion, as are job quality and social security. The neglect of issues around quality of work, job insecurity and social protection risks generating long term problems as not only unemployment, but also precariousness and limited entitlement to social security have consequences in terms of future risks of poverty and unemployment, and challenge the long term integration of young people. This is particularly worrisome in a situation in which, young people are already experiencing more temporality and substantially lower wages than adults (ILO, 2010). The use of such measures in a context of recession, in which unemployed people have fewer opportunities to find a job, seems even more problematic. The enforcement of conditionality risks excluding some of the most vulnerable from the safety net, precisely at times when they may need it the most. This post has focused on the European context; it is also a good summary of the issues faced by young people in the UK. Data published by the Joseph Rowntree Foundation (JRF) gives us a very good indication of the scale and scope of poverty across the UK today and highlights the serious nature and extent of a problem which remains stubbornly prevalent and very awkward for politicians to deal with. Perhaps most notably over the past ten years there has been a significant demographic shift in the data which now shows alarmingly high levels of poverty amongst young people. For example, 16-19 year olds now represent the highest proportion of people by age group living in poverty in the UK – equivalent to 32% in 2014 (around one in three) and this rate is increasing fast over time. The government has responded with initiatives, such as the Youth Contract, that aim to reduce youth unemployment. These initiatives are built on the same premises of activation and conditionality as EU initiatives, and are thus exposed to the same shortfalls. Labour market integration by itself does not sufficiently protect young people from poverty and social exclusion (but do not take my word for it, and check this post from Lisa Whittaker on youth poverty in Scotland). Political action must be taken to address the problems of youth poverty, both in Europe and in the UK. More so since poor young people are likely to become poor adults, and in the long run, poor pensioners. The five recommendations for the European Union that concluded the recently published EAPN report on Youth Poverty and Social Exclusion in Europe (link) show a way forward to develop European policy in the field of youth. Make sure the Youth Guarantee delivers!